Elder D. Todd Christofferson (b. January 24, 1945) was called to the Seventy in 1993, and as a member of the Quorum of Twelve Apostles in 2008. "There are many ways to describe and speak of divine love. One of the terms we hear often today is that God’s love is 'unconditional.' While in one sense that is true, the descriptor unconditional appears nowhere in scripture. 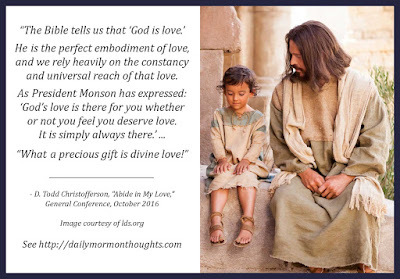 Rather, His love is described in scripture as 'great and wonderful love' (D&C 138:3), 'perfect love' (1 John 4:18; Moroni 8:16), 'redeeming love' (Alma 5:26), and 'everlasting love' (Jeremiah 31:3). These are better terms because the word unconditional can convey mistaken impressions about divine love, such as, God tolerates and excuses anything we do because His love is unconditional, or God makes no demands upon us because His love is unconditional, or all are saved in the heavenly kingdom of God because His love is unconditional. God’s love is infinite and it will endure forever, but what it means for each of us depends on how we respond to His love. "'As the Father hath loved me, so have I loved you: continue ye in my love. 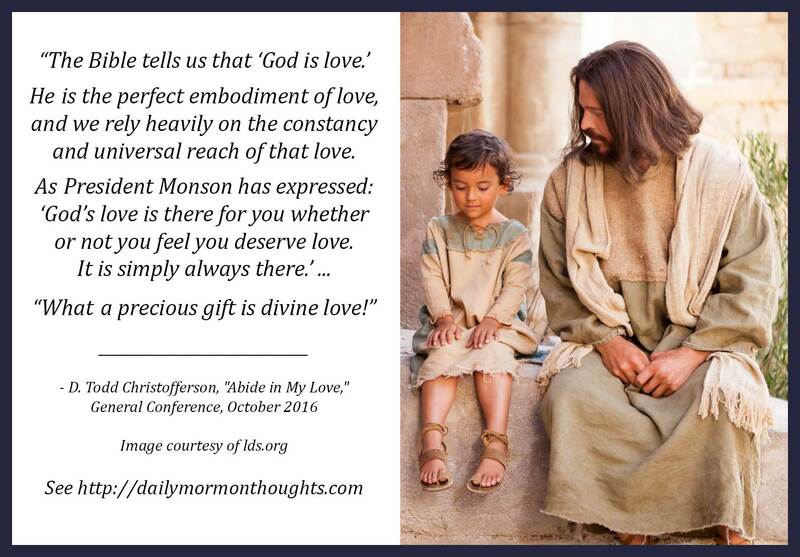 "To 'continue in' or 'abide in' the Savior’s love means to receive His grace and be perfected by it (See Moroni 10:32-33). To receive His grace, we must have faith in Jesus Christ and keep His commandments, including repenting of our sins, being baptized for the remission of sins, receiving the Holy Ghost, and continuing in the path of obedience. (See 2 Nephi 31:11-21; 3 Nephi 27:16–20; see also D&C 20:29–34.)" We all "rely heavily on the constancy and universal reach of that love" as we come to understand the blessings God offers to us. 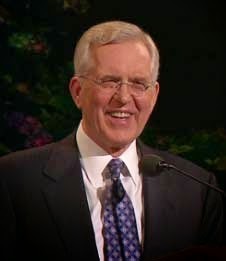 But Elder Christofferson cautions us not to misunderstand the use of the word "unconditional" when speaking of God's love for us. One of the great keys to understanding is this: "God’s love is infinite and it will endure forever, but what it means for each of us depends on how we respond to His love." He then teaches the crucial point that we must "continue in" and "abide in" His love through faith, obedience, and receiving His grace.